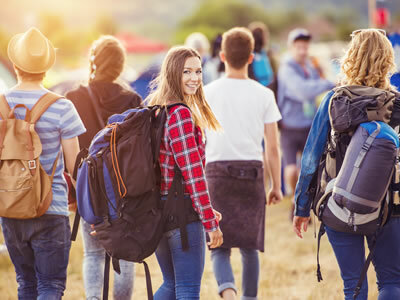 A 2016 youth survey conducted by the National Allergy Strategy showed that 50% of respondents felt as though they couldn't carry their EpiPen® during social occasions as the device is too bulky, and doesn't fit in a clutch or pocket. It can be difficult, or even embarrassing to carry an EpiPen® around when out with friends, but it's important to always have the EpiPen® and ASCIA Action Plan on/with you. In order to reduce stigma about carrying medication, 250K are hosting a competition to find the most creative and practical ways to carry an EpiPen®s and action plan. 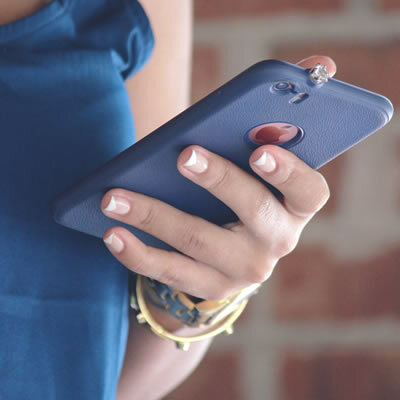 We’re asking entrants to share a short video of how they carry their EpiPen®s and ASCIA Action Plan on a day-to-day basis and/or during social events. Winners will receive a JB-HI-FI gift voucher valued at $500. 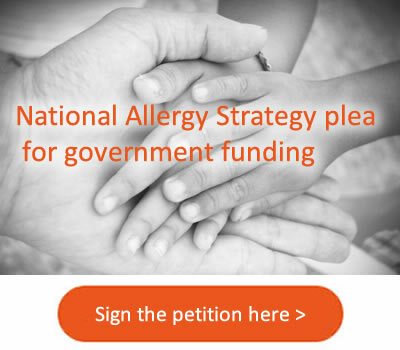 All at the National Allergy Strategy are disappointed in having to cancel the December 2018 Kalgoorlie visit. Unfortunately, there was very limited interest demonstrated by local health professionals. The Kalgoorlie visit was part of a Shared Care Model project pilot which requires health professional engagement. 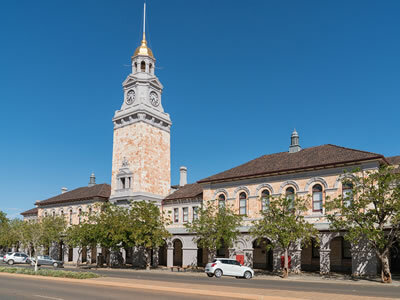 We were planning to send a team of 6 health professionals to Kalgoorlie for three days and had to no choice but to cancel as there were less than 10 health professionals (no doctors who were planning to attend an education session). 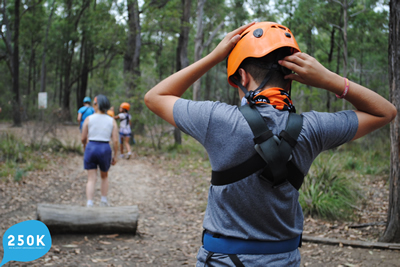 We are planning to engage with health professionals in Kalgoorlie to learn more about what support they need. 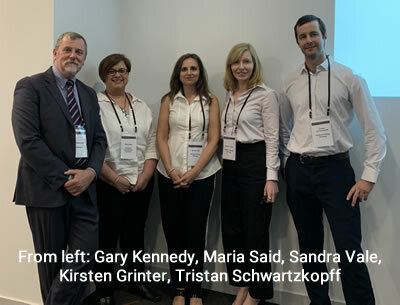 The National Allergy Strategy has partnered with Environmental Health Australia (EHA) to develop a resource hub to assist authorised officers to help improve food allergy management in food service. The resource is being launched at the national EHA conference today in Perth. 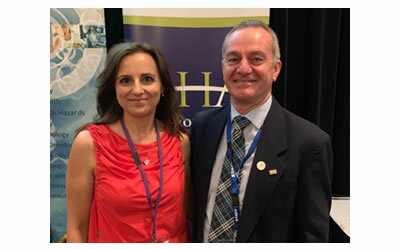 Sandra Vale, National Allergy Strategy Coordinator and Vic Andrich, WA president of Environmental Health Australia (WA Branch) shown at the launch. Today the National Allergy Strategy Food Allergy Prevention Project was launched in WA as the main pilot region for the Project. 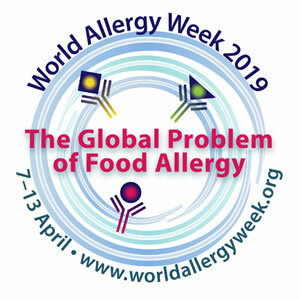 The Food Allergy Prevention Project is the first in the world to promote feeding children the common allergy causing foods by one year of age, to help prevent food allergy developing. While previous food allergy prevention strategies included delayed introduction of common food allergens and avoidance of foods in pregnancy, the Food Allergy Prevention Project widely promotes the introduction of common food allergens. This includes peanut, tree nuts, cow’s milk, egg, wheat, fish, shellfish, sesame and soy, in the first year of life. The new recommendations will not prevent all food allergies but will help prevent food allergy developing in the majority of babies. 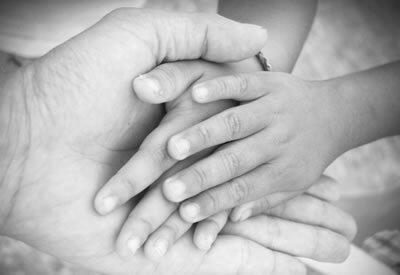 Studies show that babies with eczema may also develop food allergy by exposure to the food through their skin. 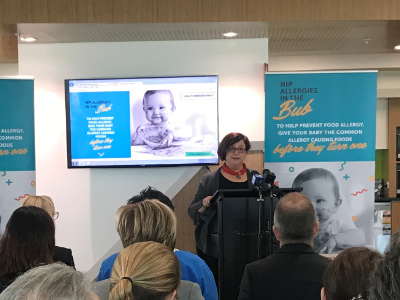 The “Nip Allergies in the Bub” website developed by the Project contains practical information for parents and carers about introducing solid foods and managing eczema for allergy prevention in the first year of life. 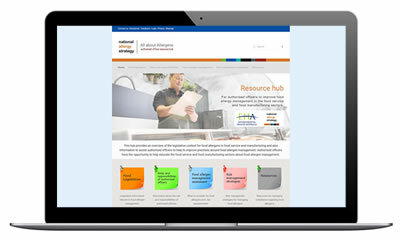 The website also contains information and resources specifically for health professionals, including e-training courses.